PEEK bolts (chemically known as Polyetheretherketone) offer a unique combination of properties for some of the most extreme applications. PEEK is classified as semicrystalline thermoplastic and high purity polymer, offering excellent mechanical strength and chemical resistance at high temperatures. PEEK bolts offer a high strength alternative to PTFE fluoropolymers. Excellent resistance to thermal degradation (chemical decomposition caused by heat). Chemically resistance to many oils, alcohols, solvents, and organics as well as harsh acids and bases in low concentrations and temperatures. Hydrolysis resistance provides PEEK ability to retain all physical properties when continuously exposed to water or steam at high temperatures and pressures, as well as offer very low moisture absorption. Outstanding creep resistance allows PEEK bolts to sustain large stresses over long service life. Ability to withstand frequent sterilization processes. V-0 flammability rating with low smoke and toxic gas emission when exposed to flame. Electrical properties are maintained over a wide frequency and temperature range. Radiation resistance allows PEEK to be used in or be repeatedly sterilized by, high doses of ionizing radiation. Depending on the application, PEEK bolts can be reinforced with glass or carbon fibers for improved strength and stiffness properties. 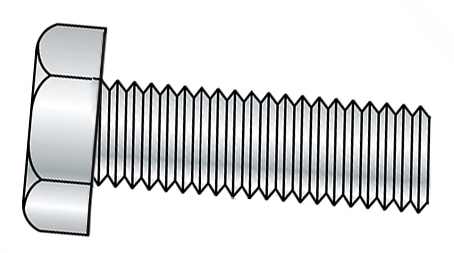 Reinforced PEEK bolts offer greater mechanical robustness especially in applications beyond 350°F (175°C). Viewed by the medical community as an advanced biomaterial, PEEK bolts are used in medical implants and are compatible with a high-resolution magnetic resonance imaging (MRI). PEEK bolts are one of the few plastics compatible with ultra-high vacuum (UHV) which is necessary for many analytic techniques and particle accelerators. Chemical processing and pharmaceutical applications depend on PEEK for it’s chemical resistance, high purity and ability to withstand sterilization processes. PEEK bolts are used in many electronics from cell phones to circuit boards for their lightweight strength and reduced noise, vibration and harshness (NVH). Bolts made from customer specified PEEK grades are available upon request. See our online store (right side) for common PEEK bolts or contact us for specialty or quantity requests. PEEK, with no fillers is unreinforced and 100% polymer. Even without glass or carbon fiber reinforcement, this one of the strongest polymers we offer and well suited for a variety of applications including FDA food contact and other applications requireing high purity. PEEK 30% Glass Fiber Reinforced provide the same chemical resistance and natural PEEK but nearly doubles in tensile strength. PEEK 20% Carbon Fiber Reinforced provides approximately 2.5 times the strength of pure PEEK. PEEK Extreme is our proprietary receipe for the highest strength PEEK utilizing carbon fiber reinforcement. This version of PEEK over 3 times stronger than standard unreinforced PEEK.